For over 25 years, TreadMaster has been the maintenance recommendation of the escalator manufacturers worldwide. HydraMaster’s self-contained, compact unit cleans and polishes unsightly stair treads . . . effortlessly! BEFORE ORDERING READ ORDERING & DELIVERY INSTRUCTIONS BELOW! 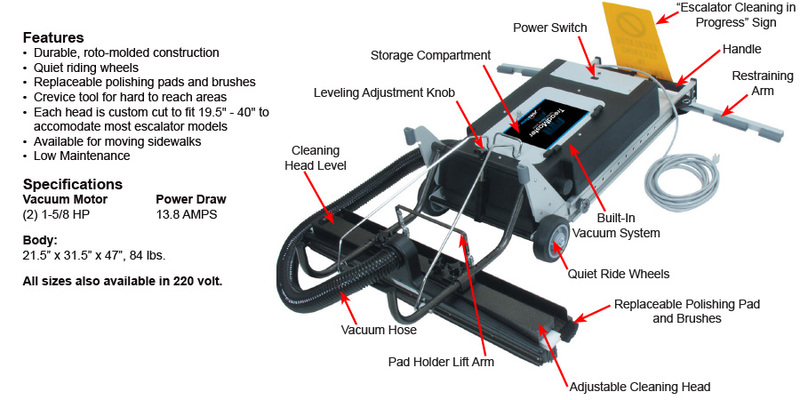 The ease of set-up and take-down makes cleaning escalator treads and moving walkways a “hands-off” job. TreadMaster frees up personnel to perform other tasks while the TreadMaster is at work. The built-in vacuum system, easily replaceable heavy duty polishing pad and nylon-grit brush ensures complete and thorough cleaning. One-stop, automatic cleaning eliminates risky, manual cleaning procedures. TreadMaster removes unsafe substances from stair tread surfaces, reducing the risk of liability hazards for customers and employees. 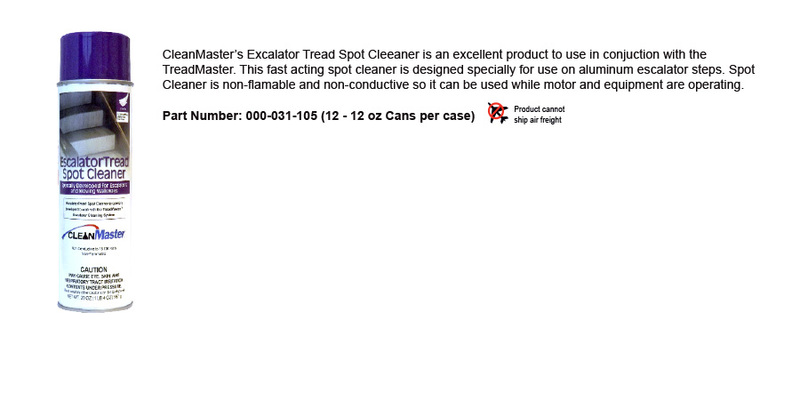 TreadMaster also comes with a handy clip-on “ESCALATOR CLEANING IN PROGRESS” sign to deter escalator passengers. Simply position the TreadMaster at the bottom of the escalator, lower the cleaning head into position, and activate the escalator. Without any repositioning during any part of the cleaning process, TreadMaster cleans and tread width completely and thoroughly. 1. Do you need a Lift Gate? Recommend if you don’t have a loading dock. 2. Do you need Inside Delivery? Instead of dropping the shipment off at the front door or loading dock, the driver needs to go inside the location to deliver the shipment. Please add ordering and delivery instructions when you place your order.You will be able to add them to the comments sections when you check out.